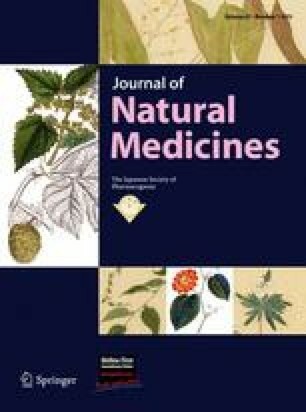 Phenylethanoid and flavone glycosides from Ruellia tuberosa L.
A new phenylethanoid glycoside, isocassifolioside (8), and two new flavone glycosides, hispidulin 7-O-α-l-rhamnopyranosyl-(1′″ → 2″)-O-β-d-glucuronopyranoside (11) and pectolinaringenin 7-O-α-l-rhamnopyranosyl-(1′″ → 2″)-O-β-d-glucuronopyranoside (12) were isolated from the aerial portions of Ruellia tuberosa L., together with verbascoside (1), isoverbascoside (2), nuomioside (3), isonuomioside (4), forsythoside B (5), paucifloside (6), cassifolioside (7), hispidulin 7-O-β-d-glucuronopyranoside (9) and comanthoside B (10). The structure elucidations were based on analyses of chemical and spectroscopic data including 1D- and 2D-NMR. The isolated compounds 1–12 exhibited radical scavenging activity using ORAC assay. This study was financially supported by The Thailand Research Fund (Grant No. DBG5480007) and Chulabhorn Research Institute. Also, C.P. would like to thank Thailand International Development Cooperation Agency (TICA) for providing financial support during study in Thailand.